Haven't found your perfect party dress yet? Holiday shopping at Macy's is an event unto itself. There are fashion shows with designers, Santaland, fireworks, tree lighting, parades or Believe Day in cities all over the country. In New York, I will be joining fashion designer B. Michael on Wednesday, December 7, 2016, from 6 PM - 8 PM. 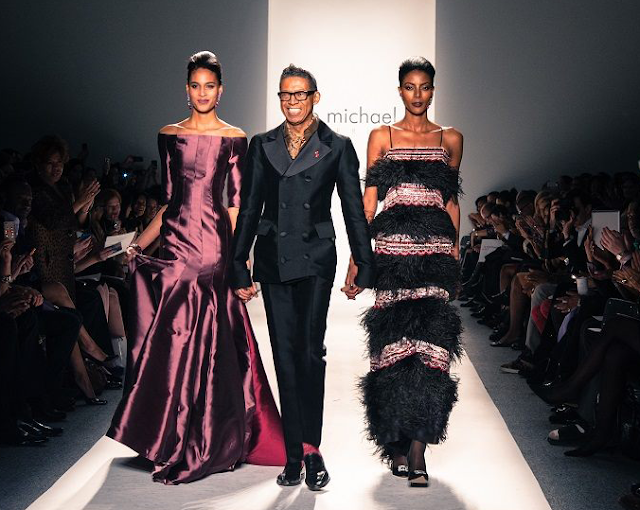 B. Michael has brought the glamor to past New York Fashion Week runways and will be at the Macy's Herald Square location to help party gals like you and me find that special dress. He's the ultimate NYC designer, starting on Wall Street before working his way through the ateliers of Oscar de la Renta and Louis Feraud. He is proud to make manufacturing his collection New York a priority. Writing as someone who has worked the industry, that is a challenging commitment to make. Some of the looks I plan on trying on Wednesday evening include a few shimmering sheath dresses and jackets in elegant abstract patterns. I particularly love the outfit with the red printed evening topper. You can consider Wednesday evening's Macy's event with B. Michael a party in itself. There will be live music and treats in addition to the fashion presentation. Just call it holiday soiree #1 (of many?) It's free! Care to join me?